The A3 report may be one of the most misunderstood lean thinking tools of our time. Why do I say this? Simple. The A3 report, in and of itself, is nothing more than a piece of paper. But, for some reason, many people believe that the A3 report – by itself – will magically solve problems on its own. The problem with this statement is that you don’t “do an A3” since, again, an A3 is nothing more than a piece of paper. Instead, problems are best solved by the deliberate application of PDCA or other improvement methodologies like DMAIC. 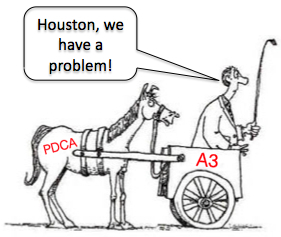 Just like the horse must come before the cart… PDCA, or some other form of critical thinking, must come before the A3 report. Now, to be sure, the A3 report is one of the best reporting tools available to continuous improvement practitioners since teams are able to tell their problem-solving story on a single piece of paper. The A3 report can also add tremendous value for other “non problem solving” situations such as when a team uses it to share the thinking and rationale of why they believe adding 3 associates to the night-shift makes business sense. I’ve also seen A3s used to share the analysis done in order to justify capital expenditures. In other words, the A3 report can be an amazing story-telling vehicle when properly leveraged by a team of critical thinkers. As usual, there have been some awesome comments to this article. Thank you for this! And, upon reflection, one thing I wanted to stress is that the A3 report, or document, or whatever you prefer to call it isn’t written after the PDCA or problem solving process is complete like a traditional PowerPoint slide deck may be prepared to report out on a kaizen event. Instead, the A3 most definitely grows and develops during the PDCA, or other critical thinking, process. But, to be clear, the power isn’t found in the A3… instead the power comes from the collaborative efforts of the team that happens to be documenting their improvement journey using an A3. Do you agree with me? Have you seen people struggle with the use of A3s since they believed this particular sized paper wielded magic powers all by itself? Agree whole heartily. I attended an A3 seminar that basically taught the power was in the layout when, in actuality, it’s the thought that must go into completing the document that matters. The only caveat is that A3’s do force you keep things concise meaning 48 slide Powerpoint presentations aren’t needed to summarize a 3 day event. I agree and disagree. I agree that the paper itself does nothing. But where I tend to disagree is that the A3 report does seem to promote a certain type of thinking. It’s almost like it offers a PDCA roadmap of sorts that helps people navigate though the problem solving process by clearly stating the background, defining the problem, etc. An A3 is a tool which can be designed well or not, and can be put to good use or not, but it will always just be a tool. Just like with any tool it takes people with the skill to use them, and an organization that desires to adapt and change, without that all they can be is another piece of unused information in a constantly growing pile. A3s only become of value when they cause action to occur. Very well said, Robert. Thank you for the comment! I totally agree with your post. At the end of the day it is the person or persons responsible for putting the A3 into action! It is simply an outline or roadmap to guide you along to the path, nothing more, nothing less… It takes the human element (trusting each other and commitment) to make it a success. That’s a good summary Ron. I had a very recent encounter with the A3, which I used in my short run projects. I think the structure is there for everyone to use, but at the same time, people should know what they need to do with the structure. Isn’t it also true with PDCA or DMAIC? Thanks for the comment, Vishy. And, yes, it most definitely is true of both PDCA or DMAIC. As a basic example, I can give my 6-year-old a map of the United States – and even show him how to read the map – but this doesn’t mean he could get our family from Texas to Chicago on his own. I agree, the A3 has more pwer than given credit for. A3 need to be looked and reviewed to ensure what is captured aligns with the issue identified and oversight shpuld be conducted to ensure that problems are captured consistently. Yes, I agree that A3 is just a paper and a different way of reporting. A3 is not going to solve the problems by itself. But, if it helps you to institute a problem solving and/or reporting culture, I would think, it is a good tool. I agree with the comments; there is misunderstanding what A3 is. You are correct in that A3 is a paper format – but have really missed the point that it is not a report, but the embodiment of a problem solving process done by a team of people. Yes, PDCA is used as well as Root Cause Analysis tools such as 5 Why’s and others. Once it is completed, it can be used as a case study for others to learn from. Thanks for the posting – and hope that I have provided some value to you and your readers. @ Andrew, did you read the article? I am not sure you did since he definitely stresses the A3 comes as a result of critical thinking and problem solving. And it is a report no matter how you want to spin it. Read some LEI books and you’ll see they too call it an A3 report and stress the need to think before you create the A3. The problem is most consultants attempt to overcomplicate this so they can sell access to their overpriced “A3” seminar. Hi Andrew, thanks for the comment. It’s healthy to not always agree! But, in the end, I think we’re saying similar things. The power of the A3 report comes when people come together and solve problems in a systematic manner – whether that be via PDCA, DMAIC, or other improvement methodologies. My key message is simple. You must think before the A3 can add value. The A3 doesn’t, by itself, accomplish anything. It’s just a piece of paper. Ron, Thank you for the article. I’d like to have a dollar (inflation) for every time I’ve heard someone say, :do an A3″. I’ve even had people argue the ‘magic’ of the paper size. It’s a tool, a document a report, etc. to concisely record the process, project, problem solving, etc. in a now universally understood format. My thought is to learn problem solving techniques and A3 formatting then use them simultaneously. Great to hear from you, John! And thanks for the comment. I disagree in that the way the article is written, it is setting up A3 separate from Problem Solving. A3, as a lean tool, has very little to do with paper. A3 is a way of thinking. It is thinking that uses the Scientific Method (PDCA). A3 thinking happens to be called A3 because the communication method used during problem solving happens to be done concisely and historically on A3 size paper. A3 has nothing to do with the paper except that a particular size of paper is used for communicating. This paper is not used for reporting (in the classic idea of presenting a report) but for communicating thinking. In my mind, there is no such thing as an “A3 report.” (You can’t report on an iterative cycle). That’s why pencil is one of the best tools for communicating the A3 thinking. Thanks for the excellent comment, Andrea. Now, of course, the PDCA process is most definitely dynamic so, if A3s are used, they will definitely “take shape” during the problem solving process… perhaps that’s where I could have been more clear. In other words, I didn’t mean to imply that the A3 document is “written” at the end of the PDCA process… instead, it most definitely develops over the course of weeks, sometimes much longer. But, the trap I have seen MANY people fall into is they read a book or two on so-called “A3 Thinking” and feel like they can grab a pencil and A3 sized paper and attack any problem without a solid foundation or understanding of PDCA. THAT, I’m sure you’d agree, is a recipe for disaster. Hi Andrea, it seems you have misread the article and are over-focusing on “it’s not about the paper size.” You seem to be making the same points as Ron. If anyone thinks A3 is all about problem solving, they are wrong. Business plans, strategies, and other things can be documented in an A3. The key idea of the A3 was never about PDCA or problem solving – it was to be concise and visual. It just so happens that a lot of what Toyota does is problem solving because they are quite active with kaizen. Some companies that do TQM use it exclusively for QC circles / storyline reports, hoshin kanri and exception reports that result from daily management (LSW) audits. but the result shows not very good, just one A3 report; little people take care on it. A3 Report or any report is made to present a problem/data/condition . If no action is taken it remains a piece of paper only. Fully agree….. I think we are forgetting the actual practice of A3. A3 report should always start before planning – a detail understanding of current situation, the values, expectation, reasons for the currrent situation etc. Once we lay this ground work, that means we are ready for the PDCA or DMAIC cycle steps. In some places where I saw that , A3 report are practicing as a lean solution tool. Very urfortunate…. A3 was never intended to solve the problem but be a tool for visual management and force you into being consisted and focus on the key issues. I find the A3 of little value. Yes i present a convenient format to present data to management, howvere it seems to force the use of improper or incorrect problem solving tools. As an example a 5 Why Chart is not a solution to a problem.. It is a clevelrtool for presentaitons. Following the DMAIC process and the tool usage in their proper order is always required for proper problem solving. The key is problem solving not group presentations. For that matter an A3,or a 8D or any other piece of paper is just a methodology of presenting a problem solving report.The actual content is based on a PDCA or DMAIC model.It is the content that really matters and not the format.But sometimes,the Format guide you through the steps so that you dont miss out any major steps.Personally I have found that the Seven step problem solving model,taught and absorbed in the right way will be a good input that can later be transcribed to any one of these formats so as to make it really effective. Great Topic. I have struggled with the question of what is the proper way to incorporate A3 “reports” into my field which usually requires multiple cycles of learning to really solve a problem. Can we think of the A3 report as a lagging indicator (the bottom line) that we want to move via leading indicator level analysis and aciton which should be found in the deeper PDCA and DMAIC formats ? Thanks for the comment, Heath. A3s can serve many purposes but, as I mentioned in the “update” of the article, they are often used during the problem solving, or critical thinking, process. In other words, the A3 grows and develops as the team learns more. Also, as another commenter mentioned, using pencil is HIGHLY recommended since lots of eraser marks are often found on the A3. Once the team feels like they are complete with the A3 they can pretty it up and use software if they’d like to. The A3 is a nice condensed storyboard tool. The main issue I see with them is the lack of thought process that goes into making sure there is a good measurement system (M in DMAIC). I’ve been involved reviewing several A3s where the issue was a poor measurement system that needed to be rectified, but this was not even on the team radar.